This 20th anniversary edition of Thich Nhat Hanh's classic commentary offers new insights into one of the Buddha's most important teachings. According to the Anapanasati Sutra, maintaining awareness of our breathing is a means of awakening to the true nature of all things and arriving at spiritual liberation. Breathe, You Are Alive! 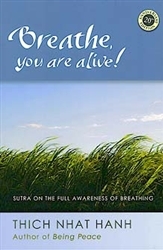 outlines the Buddha's exercises of conscious breathing along with commentaries and further exercises for daily life.